You may notice that it uses xunit to run tests. My goal was to set up TeamCity build with tests under xunit and code coverage. The first step I set up in my build configuration was a build with 'Visual Studio (sln)' runner. This runner did all the job to build my solution and produce all artifacts I need. Second step is to set up xunit tests. For this I decided to use '.NET Process Runner'. I specified there path to xunit, arguments. That was easy to set up? Right? 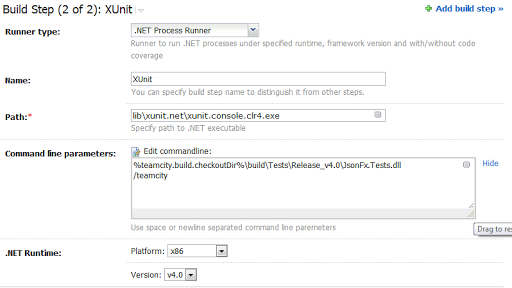 The outcome is I have created a build configuration in TeamCity that builds solution, runs tests with xunit and gathers code coverage information without writing ANY build scripts.